It's possible to tune by ear using tuning forks or pitch pipes. Tuning by ear is a useful skill and it's what orchestral players often do (because some instruments like pianos cannot be retuned easily, so you have to tune to match them). But it takes lots of practice to do efficiently. The cheapest practical alternative are electronic headstock tuners. These are all broadly similar, but performance can vary. I have a Snark SN-8 'super tight' which is better than previous ones I've tried (guitarman, guitartech), achieving a faster and more stable lock onto the note. When using a headstock tuner try to put it where vibration on the headstock is strongest. Snarks now seem to be about the same price as the previously cheaper alternatives now and most also have a metronome, of the ones I've tried they're definitely my favourite. Recently some very small ones have also appeared, like the Planet Waves tuner, if small and discrete is better for you. The next type of tuner is a pedal tuner: these use the same electronics to analyse the signal, but instead of using a piezo-pickup to detect the note on the headstock they plug into your guitar's signal chain (obviously you need an electric or electroacoustic to use these). There are advantages and disadvantages to pedal tuners. They are a bit more expensive and not as easy to carry around as headstock tuners, and if you're using a plain acoustic guitar then you have no way to plug it in. But pedal tuners really shine on stage. Since they read the guitar signal they will still work even in the presence of background noise (headstock tuners might be confused by loud background). They will also often allow you to mute while tuning and can be there all the time while not threatening to fly off at the wrong moment. Recent pedal tuners like polytunes also offer the ability to tune multiple strings at once, so you just strum and it tries to lock and show all six notes. Stroboscopic tuners are more accurate than either headstock or normal pedal tuners and also more expensive. These work on the principle that repeating the guitar signal at the frequency you're tuning to should produce a steady pattern (this is similar to tuning two notes together by listening to beats). There are also 'digital stroboscopic tuners' which are a bit cheaper. The best known maker, Peterson, even does a headstock version. These might not be needed for everyday use, but some people like them for the ability to do sweetened tunings and things like guitar setups (intonation) and studio work can need the accuracy. On the other hand you may well despair when you find out it's actually impossible to get that note to stay absolutely still. These days a good tuner program for your computer can get as good accuracy provided you have a way to plug your instrument in. I like Lingot http://freecode.com/projects/lingot, which also has a Windows version, http://lingot.gitara.org.pl/index.php.en. 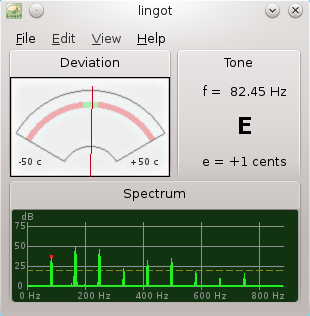 Under Linux Lingot can read from Jack or ALSA (and therefore also Pulseaudio), so whatever setup you're using it will probably work. It also supports Scala files so there is a large set of altered (non-TET12) tunings available and being able to display the spectrum lets you see how well the notes are being detected. The last option are hand-held tuners. Until recently headstock tuners had nearly killed these. 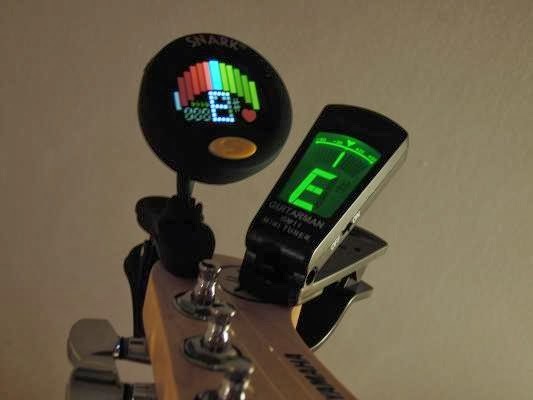 A hand-held tuner has a microphone, so is less able to pick up the instrument signal, but it's also able to work with non-stringed instruments. (Should you want to tune your saxphone. Actually, can you tune saxophones?). The common experience is trying to play the note while waving the tuner in front of the strings hoping it will detect it. But recently they've made a comeback, because a smartphone can work as one. I've got a free app for Android called PitchLab. While they still have the drawbacks of old handheld tuners (I'm sticking with my Snark), phone microphones are maybe a bit better and they can also do some clever things: the PitchLab tuner has a strobe mode (which does work on the strobe principle) and a chord detector.